Reynolds® Cut-Rite® Wax Paper's non-stick surface is ideal for making candy or dipping strawberries, cookies or pretzels in chocolate. Foods lift right off the non-stick surface without sticking. For gift giving or freezing, layer candies or baked cookies between wax paper sheets. 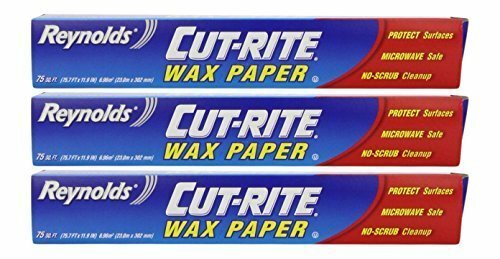 Reynolds® Cut-Rite® Wax Paper makes food preparation easier by minimizing cleanup. Shred cheese, peel vegetables or grate lemon peel on wax paper to pick up every shred. Keep counter tops clean with Cut-Rite® Wax Paper when breading chicken or fish or use it to catch sprinkles when decorating cookies and cupcakes. Cover foods in the microwave to prevent splatters and keep the microwave clean.